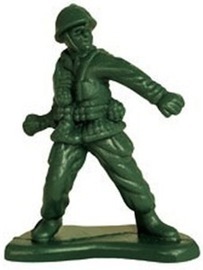 Toy Soldier is a term for a miniature figurine that could be a soldier but also a civilian or other figure. They are generally static as opposed to an Action Figure which mostly have articulated arms, legs and head. There are some exceptions to that rule like swoppet figures from Britains, Elastolin or Timpo Toys.